A February 1968 feature article on Abe by Spencer Klaw in Fortune Magazine described Abe as "a big, fast-moving, friendly man who is shaped and looks rather like a giant panda" but stated, "As thousands of business men have learned to their cost, he's a tough man to tangle with." In 1946, "on the strength of his familiarity with complicated financial transactions and his reputation as a tenacious trial lawyer," the United States Government appointed Abe Deputy Chief Counsel (Economics) at Nuremberg. As such, he was senior trial counsel in all cases against German industrialists for collaborating in Nazi war crimes. He left after eight months, because he believed that the prosecutions were impaired by inadequate human and financial resources. Abby Mann, in his introduction to the printed script of his screenplay, Judgment at Nuremberg, wrote, "The first time I gave Nuremberg any thought was when I met Abraham Pomerantz at a dinner party in New York in 1957. Pomerantz had been one of the prosecutors in the last trials at Nuremberg when the defendants included diplomats, doctors and Judges." Abe won cases and made waves. He was often in the spotlight, as in the lively February 1977 interview segment, "Lancelot at Law," on Wall $treet Week with Louis Rukeyser. On his death in 1982, the New York Times described Abe as "an articulate courtroom orator who reveled in fencing with his political and legal adversaries." Above: Abe in 1945 with Eleanor Roosevelt and Thomas F.J. Connolly. At Right: Photo of Abe by Duane Michaels for Fortune Magazine, February 1968 article. Esteemed attorney Milton S. Gould wrote, "The stockholders' derivative action flourished under the leadership of men like Abe Pomerantz . . . and it continues to flourish. I think an enlightened view of its function and usefulness is that the cause of action has proved to be the most effective instrument we have in protecting corporate ownership from misconduct in corporate management. 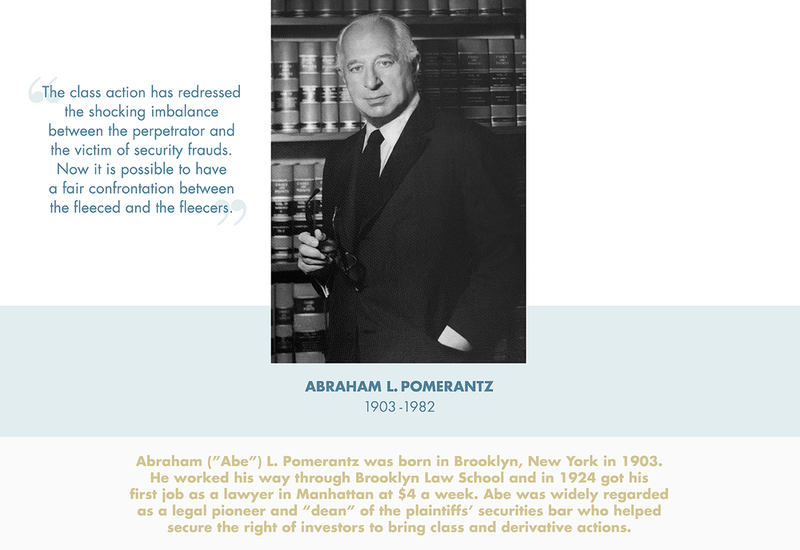 From those cases have evolved useful and concepts of fiduciary loyalty and the need for honest full disclosure... Abe Pomerantz became a hero, and his name became a synonym for the successful prosecution of the plaintiff's derivative suit. ".